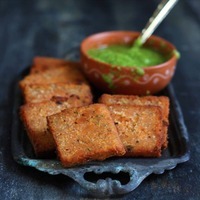 Gluten Free Masoor Dal Cutlet Recipe is a satiating party appetizer or teatime snack with crisp exterior and soft kebab like texture underneath. The term cutlet defines a flat croquette of minced meat, nuts, or pulses, typically covered in breadcrumbs and shaped like a veal chop. There are no second thoughts about cutlet being not deep-fried. To prepare the Masoor Dal Cutlet, soak the dal for 15 - 20 minutes in enough water. Next add half of the chopped onion and fry till onion turn golden brown in color. Add the masoor dal paste in the pan, roast over low heat stirring continuously till it turns light brown in color. Dal is ready when it eaves sides of the pan and all the moisture is evaporated. Grease a baking tray ( buy it here ) or large plate with little oil. Evenly spread the dal mixture in the tray with 1/4 inch thickness. Once mixture is nicely set, cut into equal shape squares. Before serving, heat 1/3 Cup oil in a frying pan ( buy it here ). Once oil is heated, shallow fry the cutlets till golden brown on each side. This recipe is awesome. I love the idea of the cutlet being vegetarian in nature, and everyone loves a good dipping or serving type sauce!! Thanks for sharing.